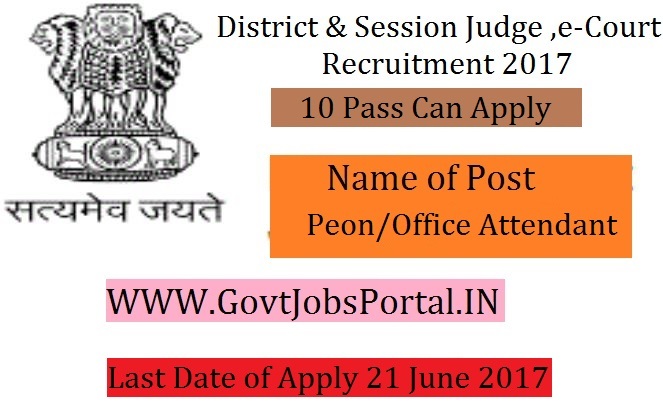 Office of the District Judge e-Courts is going to recruit fresher candidates in India for Peon /Office Attendant Posts. So, those candidates who are willing to work with this organization they May apply for this post. Last Date of Apply 21-June-2017. Total numbers of vacancies are 42 Posts. Only those candidates are eligible who have passed literate with working knowledge of both Hindi & English Language and know Cycle Riding. Indian citizen having age in between 18 to 37 years can apply for this Office of the District Judge e-Courts Recruitment 2017. Those who are interested in these Office of the District Judge e-Courts jobs in India and meet with the whole eligibility criteria related to these Office of the District Judge e-Courts job below in the same post. Read the whole article carefully before applying. Educational Criteria: Only those candidates are eligible who have passed literate with working knowledge of both Hindi & English Language and know Cycle Riding.